Yellow flowers bring ​the sunshine to a landscape, even on a cloudy day. If you're thinking in terms of color combinations, yellow flowers work especially well with red flowers and/or black flowers. Let these pictures of yellow flowers provide you ideas for your own planting beds. Picture of yellow daffodils. Yellow daffodils are one of the most popular bulb plants of spring. In addition to their beauty, what's nice about daffodils is that squirrels tend to leave them alone. Daffodils are ​poisonous plants, and squirrels are no fools. Another selling point for daffodils is their longevity. The growth of some bulb plants peters out over the years, and the plants die off. But through bulb division and seed production, your daffodils should spread as time goes by. Daffodils can be grown just about anywhere in the U.S., except for some areas in the extreme South. Because they are early bloomers, daffodils can be grown under deciduous trees. While the latter are still bare, daffodils will be taking in nutrients from the sunshine via photosynthesis. Even after the deciduous trees come into leaf, daffodils will continue to store nutrients for next year, so resist the temptation to cut back the plants' foliage after the flowers have faded and died. 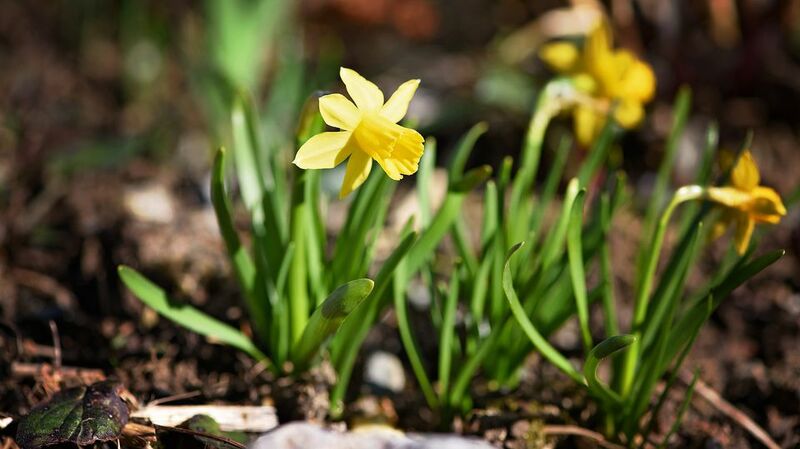 As long as the foliage stays green, your daffodils are sending nutrients to the bulbs underneath them. These nutrients will be important for the next year's growth. But when the foliage begins to turn yellow, you can cut it off. For more on daffodils, see white daffodils. Yellow Archangel is a Lamium plant with a yellow flower. Lamium flowers thrive in shade gardens. Lamium plants are also known as "dead nettle". As you can see from the photo, the leaves are variegated. Spring blooming yellow alyssum is a ground cover with yellow flowers. Don't confuse yellow alyssum, which is a perennial, with white alyssum, which is often treated as an annual. In the picture, yellow alyssum is planted with phlox, another ground cover, along with a stone wall. I love the way this plant cascades down stone walls, beautifying even the plainest of structures. Picture of golden chain flowers raceme. Golden chain tree flowers appear in late spring. In the northeastern U.S., golden chain trees are valued as one of the relatively few flowering trees with yellow flowers. Some witch hazel plants (they can be "small trees" or "shrubs") bear light yellow flowers in late winter to early spring. For example, Hamamelis x intermedia 'Arnold Promise' blossoms in late winter to early spring, depending on where you live. There are other types of witch hazel plants that bloom in late fall. The picture of Kerria here shows a young shrub, the width of which is greater than the height. But in just a couple of years, this Kerria shrub grew significantly and did a dimensional reversal: it is now taller than it is wide. Pruning may have helped spur this change. In addition to the pure beauty of its yellow flowers (more golden, really), Kerria boasts long, if somewhat uneven blooming periods. The result is some degree of floral color, at least, from spring to fall. In winter, it's easy to pick out the Kerria shrubs on people's properties when you're out driving around: if you see kelly green to greenish-yellow arching branches, complemented by smaller branches in a zigzag pattern, it's most likely Kerria. Picture of yellow forsythias, truly a herald of the spring. Please see my full article for more information on forsythia shrubs. Marsh marigolds (Caltha palustris), also called cowslips, are common streamside and swamp plants. They perform best in full sun to partial shade and prefer a soil with a neutral pH. Marsh marigolds grow 1'-2' high and bear yellow blooms in (depending on your region) March-June. These potential water garden plants have shiny, succulent leaves. But don't let the beauty of those leaves fool you: marsh marigolds can cause skin irritation, and they should never be eaten raw (bring to a boil, throwing out the first couple of pots of water). Marsh marigolds are indigenous to 33 states in the eastern and midwestern U.S. and West Coast, including Alaska. Picture of a yellow iris. Go to the article on bearded iris flowers to gain a greater understanding of this group of plants. The plant received its name from the rainbow goddess from Greco-Roman mythology and refers to the fantastic array of finding in this genus. Picture of a "Stella d'Oro" daylily. Why do gardeners like Stella d'Oro daylily so much? Well, for one thing, it stays relatively short. This is not the case with many other daylilies, which are tall and flop over in the face of high winds unless they are properly staked. Stella d'Oro does not require staking. Stella d'Oro daylily also blooms earlier than many other daylilies, is a long-blooming perennial and is capable of reblooming. Another fact that accounts for its popularity is that it's not fussy about the conditions in which it grows. Add fragrance and the good looks of its buttery-golden blossoms to the equation, and it's not hard to figure out why so many gardeners grow Stella d'Oro. Notice that, throughout this description, I have referred to these plants as "daylilies," not as simply "lilies." The two names are not, in fact, synonymous. A true lily belongs to the genus, Lilium. Daylilies, meanwhile, belong to a different genus: Hemerocallis. "Why is this distinction important?" perhaps you ask. The answer, in part, is reflected in the common name, "daylily." A daylily flower lasts only one day; the flower of a true lily lasts longer. So if you wonder why the individual flowers of your Stella d'Oro die so quickly, take comfort in the fact that you're not doing anything wrong: this attribute is in the plant's genes. Picture of a yellow yarrow. From our earliest days as children, we are intrigued by the "flat-top" look of both white and yellow yarrow. Picture of a black-eyed Susan flower (Rudbeckia). Black-eyed Susan flowers bloom from early summer to autumn. They will reach a height of 2'-3'. Grow black-eyed Susan flowers in full sun. Black-eyed Susan's flowers are a cold-hardy plant and can be grown in zones 3-10. Known to bird watchers as the flower that produces seeds adored by such species as the cardinal, sunflowers are also attractive landscaping plants in their own right. Picture of yellow Centaurea plant (C. macrocephalus), visited by a bee. Better known Centaurea flowers are the blue annual bachelor buttons and the purple perennial bachelor buttons ('Amethyst Dream' cultivar). Not as well known as the poppy plants with red or orange blossoms, such as are found on the oriental poppy plants that I discuss in my full article, yellow poppies do exist -- and are quite striking. The picture shows an Icelandic poppy flower. Picture of goldenrod flowers (sometimes misspelled "golden rod"). There are many varieties of goldenrod, but my favorites are those that bloom in late summer or early fall, such as rough-stemmed goldenrod flowers (Solidago rugosa). Just as forsythia heralds spring with masses of yellow flowers, so the aptly named "goldenrod" ushers in the fall. Native to North America, it is drought-tolerant, along with many other natives such as Coreopsis spp. For a pale yellow color, Moonbeam coreopsis is popular. Goldenrod has several medicinal applications. Amy Jeanroy, Herb Gardens expert, mentions that goldenrod's uses include as an expectorant, for soothing inflamed tissues, and for respiratory and kidney issues. Azaleas are members of the Rhododendron genus and come in many flower colors. Rhododendron 'Narcissiflora,' a Ghent hybrid azalea, bears yellow flowers in June in Maine's famous Asticou Azalea Garden. It does come in other colors (mainly pink and, especially, white), as well, but I prefer the yellow Potentilla. Potentilla fruticosa, that is. It goes by the common name "bush cinquefoil." The bush specification is to distinguish it from the various other cinquefoils out there, some of which are ground-hugging weeds. Another part of the common name refers to the fact that it has five leaves (cinque = 5, foil, as in "foliage," = leaf). In the broader picture, these shrubs are in the rose family. Perhaps you've also encountered the common name "trefoil" (as in bird's-Foot trefoil), in which case the plant in question has three (tre-) leaves. A very hardy plant, some report cold-hardiness extends all the way to growing zone 2 for yellow Potentilla. Grow this shrub in full sun and cut it right down to the ground in early spring (it blooms on new growth) to keep it compact. Such trimming will also promote enhanced flowering. At 1-4 feet tall (typically on the low end of that range here in New England) with a similar or somewhat larger spread, yellow Potentilla is a good candidate where you're looking to create a low shrub border. Its leaves have a fine texture, useful for creating contrasts with plants of a coarse texture. But this bush is grown mainly for its flowers, which bloom right through the summer. The flowers are small (1-1 1/2 inches across) but numerous. As you can see from my picture, a star shape is etched into the middle of the blooms, giving them more character (although this is noticeable only when they're viewed up-close).